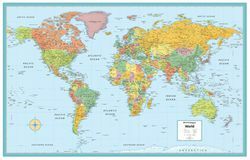 Rand McNally's Signature World Map is one political world map that qualifies as a bargain! Up to date country boundaries and plenty of city names. We recommend this as a world map for kids too because the bright colors make the countries easy to distinguish and the coloring also attracts those little viewers!